Although you wouldn't know by looking at my neighborhood, Katy is historically an agricultural town. Its main crop has been rice. This surprised me at first because when I think of growing rice, I think of the amazingly beautiful rice terraces I saw in the Phillipines and Katy's nothing like that. But on further reflection, the climate isn't all that different - hot, humid, lots of rain. And there are certainly a lot of flooding fields in Katy as well. 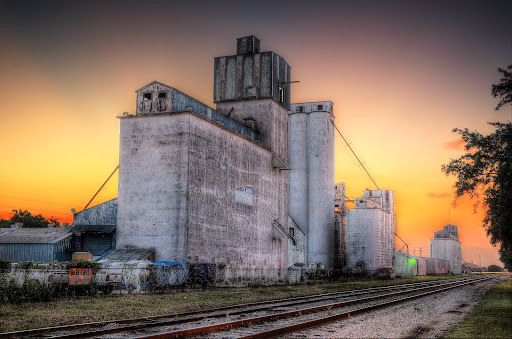 This photo is of an old rice mill in "downtown" Katy, which is actually more rural than any other part of the town I've been in. I woke up pre-dawn this Sunday to take advantage of the golden hour in order to get this and a few other photos.